I’ve had quite a few emails about this blog post: From 6b to 8a in 4 Weeks asking me exactly what I have been doing and how I went up through the grades so fast. Well, I’m happy to report my level has increased a notch again since I wrote that post, and I feel in pretty good shape. So I think I am on target for 6b to 8b in 3 months, we shall see. Note: I am no training guru, in fact I am quite the opposite, so if you do know something about training, and you have any opinions on how I could be doing better, or any other advice, then do let me know! Firstly, if you have never climbed harder than 6b please don’t expect to follow this plan and climb 8b in 3 months. It might work but it most likely won’t. My previous personal best sport grade is 8b+ and I have onsighted quite a few 8as, so although I did start this season by climbing 6bs, it didn’t take me long to get above that level. Coming back to rock climbing after a full winter of skiing, and a summer of little climbing last year did mean I started at a low level. I ticked over for a couple of weeks by doing 2 route climbing sessions per week at the indoor wall, climbing about 6b, then I started trying to improve. The first 2 weeks were actually just to get used to climbing again. The main difficulties for me trying to train with no base fitness is the simple fact that I am not fit enough to train. Reading articles about doing circuits and laps and 4x4s etc is all well and good, but my arms were not up to that sort of thing. So I went steep multipitch climbing in the 6th grade, and basically this meant that I did lots of pitches of the right standard to get me tired, and this also stimulated me to keep trying when I was already a little bit tired (nothing like a 400m drop beneath the feet to give a little extra mental boost…). It also got me psyched. I love climbing, and I love long routes, so this was a great kickstart for me. Summary of Week 1: 3 big days of multipitch climbing in 1 week, plus 2 very short indoor bouldering sessions. Then I went to Spain for a week, to be inspired by friends, and climb more pitches. I started off pretty easy, and (the grades are a bit easier in Spain) I could onsight 7as by this time. I climbed a little bit every day for 5 days in a row, just three or four routes per day, and by the last day I onsighted 2 7b+s. My friends were encouraging me to try harder routes, but I resisted the temptation for several reasons. Mainly because actually I had tried really bloody hard to do the 7b+s, but also because I was wary of injury, and also I wanted to finish the trip on a high note. Summary of Week 2: Climbing outdoor sport routes in Spain for 5 days in a row from 6c to 7b+. Coming back from Spain I took a rest day, and then started training again. I stuck with doing 4x4s in the local bouldering wall, choosing moderately steep crimpy problems of a basic style. I added to these with some basic finger boarding exercises. I usually did double session days with 4x4s at lunchtime and fingerboard (just 30mins) in the evening. On the board I did repeaters on a few key holds, and 20 sets of 10 pull ups on jugs. I also climbed outside 3 times during the week, and redpointed a tough 7c in a couple of attempts. The outdoor climbing was overhanging, physical sport climbing, mainly on routes that I had done before. I was climbing several pitches each session until I was tired, but not exhausted. This included toproping a couple of routes after leading to increase volume of climbing etc. Note: Throughout this training plan I have never trained to exhaustion, and I have never felt exposed to injury. It is worth noting that on top of all this climbing training I have been doing stretching and push ups around 3 times per week. Summary of week 3: Three outdoor climbing sessions trying as hard as I could on routes up to 7c. 2 days of indoor training with double sessions: bouldering wall and finger board. Week 4 was very similar to week 3, except that instead of redpointing a 7c I redpointed an 8a. This took 2 visits, and I had quite a few tries on the route on my first visit, making sure I had the sequences dialled for the next visit. I managed to do it on my first try the second visit with relative ease (and cold hands!). I still didn’t have loads of fitness, so I think one or two redpoint attempts were all I would have been able to do, so firing it off straight away was the best idea! Interspersed with the 2 outdoor sessions were indoor bouldering and finger board sessions similar to the previous week. Summary of week 4: Two outdoor sessions on steep rock resulting in an 8a redpoint. 3 or maybe 4 indoor days on bouldering and finger board doing double session days. Week 5 and 6: I have just taken two weeks off from hard climbing, and been on holiday. I have climbed quite a bit, onsighting fun routes up to 7b, plus I have been trail running and cycling. I’m now back to training and trying hard routes again, this time an 8b. I have increased the difficulty of the finger board routine, and added leg raises and core work to the routine. I’ll report on this section in more detail when I tick the 8b! (I hope!). I hope that is useful to someone (Bjorn or Jim? – and good luck with your operation Jim) and happy climbing everyone! 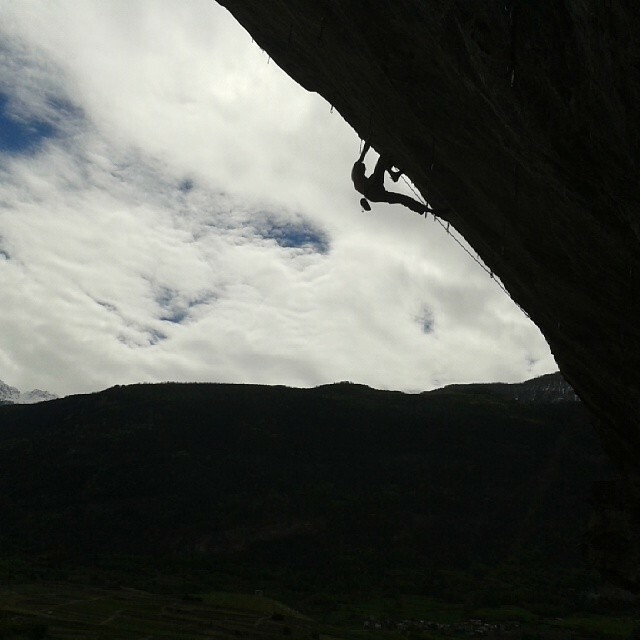 Me on the initial section of Parsifal (8a+) at Sarre Roof. The extension is 8b… come on arms! Photo by Adam George. YOU have been stretching??? times and wonder!! I know – crazy times. Also I hear you aren’t drinking much beer. Who would have thought? !